I saw the Narnia movie today and guess what?! There were POLAR BEARS in it. 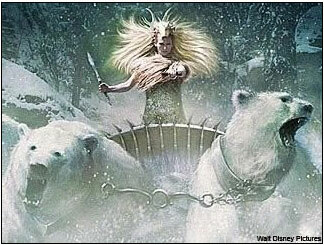 But they were on the side of the White Witch. They were "evil" polar bears. Wah. Why are the polar bears part of the bad guys? I didn't think the kid actors were very good. Makes you appreciate the Harry Potter kids. Whoa! That's scary. Do you think they are evil because the witch enslaved them? Maybe she will only give them food if they are evil. I think that's what happened with Snowy. Whoa, Shnoodles, that was fast. Take a chill pill.... it takes a minute to upload. Posted: Sun Dec 11, 2005 5:49 pm Post subject: who-where-how?! Whoa... what the.... did you just CHANGE your post? The movie wasn't all that great. The kid actors were kind of weak, makes you appreciate the Harry Potter kids. I thought it was also pretty S.L.O.W. It took them like AN HOUR to even get in the god$@*# wardrobe. Cmon people. Some of those kids in those Narnia threads were freaky religious. Ack. I watched the Narnia credits and there was someone named "Dean Zupancic" Made me think of you!! Dooby dooby doo. Hey guys, just woke up from a snooze. Thought I'd check out the forums! Let's see, lots of new posts! Hoobitty hoo. Shnozberries. Hoo hoo. What's this? Motion pictures. Clickity. The white witch. Hmm sounds scary. Should I click it? Where's Petri? Hmmm. Posted: Mon Dec 12, 2005 7:49 pm Post subject: Oh nos!!! Lee tsk tsk tsk, you have to be more careful and not allow Nibs to post the scary pictures anymore! DONT LET DUDDLES READ THE NEW POST UNDER BUNNY-SPOTTING ON FILM. It's WAY too scary for him!!!! Posted: Wed Dec 14, 2005 8:08 pm Post subject: I'm OK! It was just a bit stuffy and I fainted. I'm OK now. I'm going to read about bunnies with Petri now. It's hard to turn the pages though. Do you think Schlop could come over and help? I'd ask him myself, but I'm not yet quite cool enough to talk to him. Almost! The new movie comes out... today! Is anyone gonna go see it? Are there polar bears in it? Wow, this thread is pretty old. It hasn't seen the light of day in a while. I was just rereading it and wow, that's like the most I've ever heard Duddles say at one time- crazy! He was so talkative that day! Anysneech, I just saw Prince Schlopian. Hmm... I didnt see any polar bears in the film. There was a brown bear though who had a few funny moments. And I'm pretty sure I spotted a teddy bear in one of the opening scenes before they go to Narnia. That's it for the bear report. I tried really hard to lower my expectations enough to like this movie. The hardest thing to overcome was the truly terrible accent that Prince Schlopian had- some mix between Russian and Spanish and it really took away from his character. Blech. The main 4 kid actors are still truly awful (especially the little girl). I was also realizing that the dynamic between the siblings is just not intriguing- they're always snapping at each other and mistrusting each other. I think your main characters need some level of camaraderie to get you rooting for them. There was one scene I liked where they do a sneak attack on the castle, with the help of some griffins. That was kind of cool. But the CG animals, specifically the mice, were so distracting. The badger kind of looked like Duddles though so he was cute. There was also one scene they filmed at this cool beach in New Zealand that I knew about so that was cool. And there was a water god made out of water that ate the bad guys. But otherwise, definitely a very linear and disappointing film. Would've been better with polar bears!